my 1984 VT 750 Shadow the day I got it, 5 and a half years ago. faded sun wrote: my 1984 VT 750 Shadow the day I got it, 5 and a half years ago. I love the japanese. cruisers from the 1980s. They are very unique looking and look nothing like the cookie cutter cruisers of today. 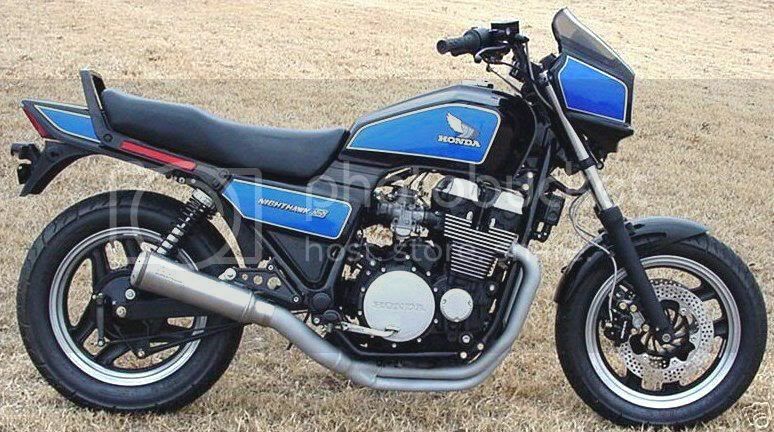 All Japanese bike designs from the 70s and the 80s have aged remarkably well. They have all taken on that great classic bike look. I am gonna pick up my newest aquasition next week a 1972 Honda sl350 I am very excited about this!!!!! One of my classic dream bikes would be either a CB1100F or even a CB900F. Those 1100's are quite rare today. Look, my evil twin on MY bike! It's amazing how nice and comtemporary the '84 Nighthawk still looks today. This incarnation of the Nighthawk was a great bike. Too bad Honda only made it for a couple of years. I owned one of these in red and it was one of the best bikes I ever had. Would jump on one today no question. Loads of power and lovely and smooth with that shaft drive. "one of the best bikes I ever had"
This is why I say to others you have to get the bike that stirs your heart stings.